The Lac qui Parle Historical Society is sponsoring a bus tour to the Andrew Volstead Home Museum and the Fagen Fighters WWII Museum in Granite Falls on Saturday, April 21st. The Riley bus will depart from the Lac qui Parle County Museum parking lot at 9:00 am. We will travel to Dawson and meet at the Dawson City Building. We will leave Dawson at 9:30 a.m. Our first stop in Granite Falls will be at the Andrew Volstead Home Museum. After touring there for about an hour, we will then go to lunch at The Rock, a new restaurant in Granite Falls. After lunch (approximately 1:00) we will go to the Fagen Fighters WWII Museum. Departure from the Fagen Museum will be at 4:00 (or earlier if everyone is finished looking). The Volstead House Museum – Andrew Volstead was born in 1860 in Kenyon, MN. In 1883 he began practicing law and then in 1886 he moved to Granite Falls. 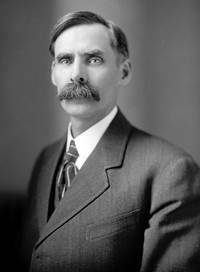 Volstead served in the U.S. Congress from 1903-1923. He spearheaded the passage of the National Prohibition Act (known as the Volstead Act). This act was the legislation for the enforcement of prohibition in the United States beginning in 1920. He co-authored the Copper-Volstead Act in 1922. This act legalized agricultural cooperatives which are still in operation today. Every time grain is sold and fertilizer or fuel is purchased, we witness the results of this act. Volstead is in the Norwegian-American Hall of Fame, the National Agricultural Hall of Fame, and the Cooperative Hall of Fame. The Fagen Fighters WWII Museum – This museum is home to a pristine collection of fully operational, active aircrafts and vehicles from World War II. It also features fine art, bronze sculptures, interactive multimedia displays, and an ever-growing library. The facility is designed as a self-guided experience, and gives a rare look into the lives and legacy of the Greatest Generation. All the exhibits tell a moving story. Have you ever wondered who “Kilroy” was? The quote “Kilroy was here,” is from that period. The museum also includes a movie theater that features stories and memories from WW II veterans. The cost of the trip is $35.00 for museum members or $40.00 for non-museum members. For more information about the bus trip contact the museum at 598-7678. Sign-up for the trip should be completed by Tuesday, April 17.